First off, the Santos celebrated their third annual Gift Card Drive in December. We collected over 20 cards amounting over $500. Special thanks to Jeremy Lithgow contributing from far, far away and Royce for hosting the holiday party. Attached is a photo of us presenting the cards to Big Brothers Big Sisters. Second, everyone needs to start planning on the following games this spring. First game is March 23rd. There are a couple tournaments coming up including Sand Rugby in and Celtics in May. These are both 7s events. I attached a poster of the game schedules. Thirdly, practice. Yes, I’m talking about practice. Next Saturday, Februrary 23rd, we will be heading up to Vegas to practice with the Vatos. Make it! Also, plan on practice starting soon during the week and Saturday afternoons from now until the Vark game in March. The DIII Pacific South Playoff match was @ Tucson at Estevan Park at 1pm on Saturday, May 5th. US National Quarter Finals @ DFW Texas May 19th. PS, the winners will travel to Tucson for a match against the SoCal winner on May 5th. Long road ahead. One match at a time. 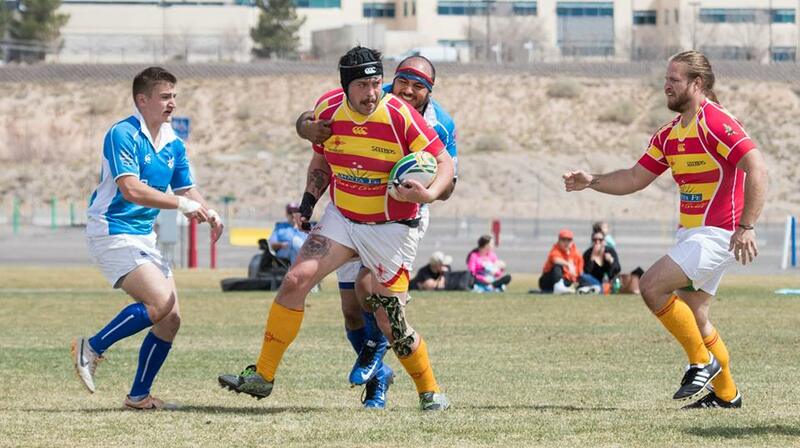 The Santa Fe Rugby Football Club fields a Men’s Division III team in the Rio Grande Union and competes throughout New Mexico, Colorado and Texas. Regular season games are usually held on Saturdays and all are welcome to watch and practice with our inclusive and diverse team. The following was taken from a newsletter written by Dave Wheelock in honor of the Rio Grande Rugby Union’s 40th aniversary in 2014. In addition, the attached images below are of a “High Desert Classic” program flyer (page 1 and page 3) and from approximately 1973 prior to the official formation of a few of today’s current New Mexico Rugby Clubs. Following in the spirit of a similar effort on behalf of the Santa Fe Rugby Club a couple years back, here’s a primitive stab at the early days of the Rio Grande Rugby Football Union. Your correspondent, being of an advanced age and somewhat the worse for wear as a result of nearly 30 years in the back row, makes no claims to absolute accuracy of events, and as for dates and scores, well, dream on. Those details are for other dinosaurs to fill in (those who did not lose their memories through tackling and post-match revelry – in other words, lesser types). If you know one of these relics, run and show him this treatise; he may wish to correct/add to/bore you with embellishment. My first memories of rugby will forever orbit the metal gridiron goal post which stood in the middle of Johnson Field on the University of New Mexico campus, circa 1972. The rugby field (no one heard the term “pitch” until years afterward) ran N-S in those days, and the extensive warmup prior to practices always consisted of the guys (college kids with a few experienced transplants, like balding attorney Greg Worley, who at about 30 years of age, seemed impossibly ancient) lazily punting the ball back and forth between the uprights. I still vividly recall almost all of my first teammates. Such has been the importance of rugby to my life. This was, of course, prior to the founding of the Rio Grande Rugby Football Union, at the then-annual all-comers tournament in Socorro in 1974. More on that in a later edition. The Gentlemen of New Mexico RFC had already become the UNMRFC to distinguish themselves from the nascent Santa Fe club. It was against those upriver worthies that I got my first run, a scrimmage at SF’s long-serving Ashbaugh Park. In those early days, if we were not playing Santa Fe, it was off to Denver or Austin or some other exotic place, reciprocating matches the following season with as much Budweiser as giant prop Richard Mateucci would spare us from his Premier warehouse. Watch for more on the social side in an upcoming edition of this fine rag. Well before I left UNM in 1975, some students at New Mexico Tech, led by the late Tim Franklin and the very much alive Hans Paap (then Waight) started a club in Socorro, and a wild crew of primarily UTEP students had kicked off the El Paso Scorpions. One of the most-storied clubs in Rio Grande history, New Mexico State, also dates back to the early 70s. A Kirtland Air Force Base club, the Nomads, also formed in Albuquerque, and sometime in there, the Aardvarks formed from a core of experienced UNM players. Some years later, perhaps the late 70s, amidst the rise and fall of rugby clubs around the state (Holloman AFB, Pecos Valley Oddballs, Farmington under a variety of names), UNM once again became pregnant and produced the Brujos RFC. About this time, too, Durango and the irrepressible Jim Simms came into play. I use the word “wild” to describe the El Paso club based on personal experience. I played for UNM in what must have been one of EPRFC’s very first matches, at a practice field near the Sun Bowl, sometime around 1973. It was near Halloween, dim memory suggests, but for whatever reason, the EP players (did the nickname come later?) had painted their faces hideously, and engaged in expressively loud grunting when tackling, which struck us as somewhat coarse. (Even in those early days we neophytes somehow had clearly defined, highly revered boundaries of things “rugby” – this may have been the influence of early prophets such as Ray Marrone, Rocky Shasco (sp), Pancho ?, Pat Whelan, et al.) For their part the EP boys doubtless took us for sissies for complaining, giving birth from the get-go to the misunderstanding that stood for many years between north and south. I hope the reader has enjoyed this modest effort on Rio Grande Rugby Football Union pre- and early history. The next edition, assuming the survival of publisher and cub reporter, will delve more closely into the curious beginnings of the Rio Grande RFU in the bowels of a NMT dormitory. All non-violent feedback is welcome, particularly details surrounding RGRFU’s founding, as well as suggestions for future scribblings. has a family member going through cancer treatment. Let’s support him to the best of our abilities. Bellow is a link to a go fund me page for this individual and the cost of the treatments. There will also be a silent auction to raise money. Dave has given the following details bellow. My brother-in-law, Ernie Gonzales, has been a loyal Santo supporter since the 1970s, before the team officially adopted the nickname. He is well-known to generations of Santos. 2. The other, a dance & silent auction on April 14, is described in the attachment. Thanks for an amazing Tournament turn out! Remember to join us again in 2018. Rio Grande Rugby Union AGM Meeting and Santa Fe 10s Tournament! Follow Our Latest Info via Email! Enter your email address to follow this blog and receive notifications about new information by email.